Apple products cost too much! If you were thinking about buying a new MacBook Pro, we must ask that you please step away from the computer and lay your credit card on the floor! Can you afford a $1,500 or $1,800 MacBook? You know, the Macalope realizes this is the age of gaslighting but he didn’t expect to be gaslighted (gaslit?) about a laptop purchase. My advice: wait. Unless you’re also in the market for a $1,400 Apple Watch 2 with Stainless Steel Case and Fauve Barenia Leather. OK, these are not equivalent. 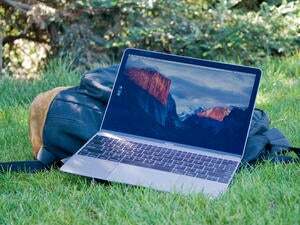 You could make an argument that the MacBook Pro is too expensive, but it clearly provides a level of utility that’s demonstrably greater than that of a fashion statement. Also, its level of utility is clearly higher than that of the next cheaper MacBook. Not so with the Apple Watch; the aluminum Watch has the same utility as the stainless Watch. Retailers will eventually offer discounts on the new MacBook Pros. Of course! Why not wait months or even years to get that laptop? As the Macalope is fond of saying, never buy anything. Just wait until you’re lying on your death bed, moments from expiring, and buy everything you ever wanted. That way you can get them all at the lowest possible price with the most advanced technology ever. It’s the only way to be sure you’re getting the most bang for your buck. Those last five minutes will be nothing but sweet, optimal enjoyment of a good deal. Most MacBook Pro reviews are positive but the focus isn’t on the price. But they’re still positive. And the reviewers do know the price. If the MacBook Pro were really egregiously priced, they’d probably focus a lot more on it. The fact that they aren’t disproves your whole theory. …a key focus for a review should be price when a 13-inch laptop starts at $1,500. Crothers may be surprised to learn that some of the most expensive automobiles in the world come with only two doors! Someone should write an exposé on that. Yes, I know you can’t argue with success and Apple is already selling a lot of new MacBook Pros but that doesn’t mean you have to run out and buy one. Crother’s complaints about the price don’t mean you shouldn’t, either. Doesn’t matter, though, because technically you can’t get one right now anyway. They’re back-ordered almost until 2017. Here’s the takeaway from all this: If you want a MacBook Pro but can’t afford one, wait. If you want a MacBook Pro and can afford one, go order one. File this under not-so-hot takes.